Dreame is a dreamy community for female readers and writers providing captivating, serialized online fiction. 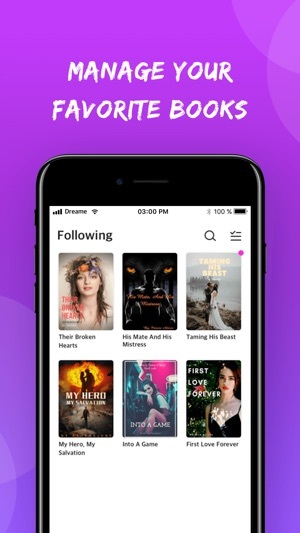 It is a reading platform where readers can immerses themselves into the latest fascinating stories anywhere anytime; a dream land where upcoming authors can fulfill their dream as a successful writer. 1. The rules for unlocking“Wait-for-Free" episodes has been improved. 2. Readers can check the timetable for "Wait-for-Free" episodes in the Library. 3. Two new sections of "Selective List of Stories" and "Ranking" have been added on the discover page. 4. More user experience has been optimized. I love some of the stories that this app provides, but a lot of them have grammar mistakes and are hard to understand sometimes. I like that there is a concept of coins, but it is hard to read anymore stories once I run out and there aren’t anyways to get some for free. 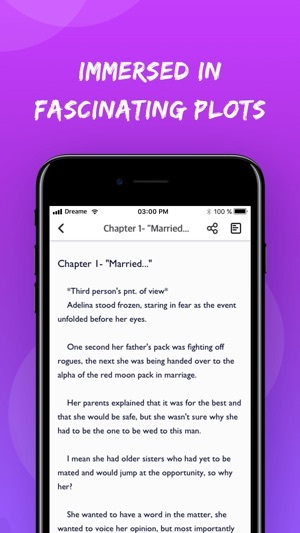 Maybe the maker of this app can bring in daily coins or ads every 4 chapters a reader reads so they can keep reading the rest of the story in peace without a notification asking for coins. I got to a point where the notification popped up, but I didn’t want to pay for coins and there was a tab that was going to let me read it for free. The tab wasn’t useful at all. It said that I can read the chapter in one week. I got frustrated by the thought of needing to wait a week just to read about 2 more chapters then getting the notification again to wait longer. Can the publisher fix/improve this please? I also visited the writers’ site that authors can publish their stories and I got more frustrated. Everything was in SPAINISH!!!!!!! I for one don’t read/understand it much! Why can’t it be in English?! This got even more frustrating! Please fix this! Even searching on the internet and selecting a story for a different site is faster and free! Sorry for the issue. Could you please provide the titles of the books with many grammar mistakes to contact@dreame.com? There will be reward for your report. 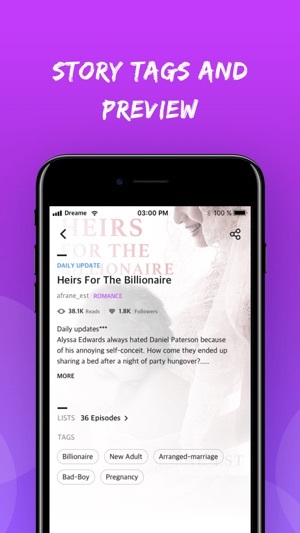 And there are lots of free good stories on Dreame, not all the stories require for coins. We understand that many readers want to read for free, but we hope you can realize that you are supporting your favorite stories and authors. It's a great app, I love the layout and there's only one thing I would want to be improved for there to be a 5 star rating. The first being that when I finish a story I would like the option to click a button(like a finished button) that would take it off of my current reading list but keep it off my suggested. It would be improved alot if (and I know this is alot harder and probably not possible) that most stories be the wait to read ones, as I don't have a million dollars to read all the stories I find interesting but cost coins. Overall a easy to navigate app with no issues. Obviously there will be some spelling mistakes as its written by real people without publishers, that's not a problem. The stories pick up from where I left off for the most part. 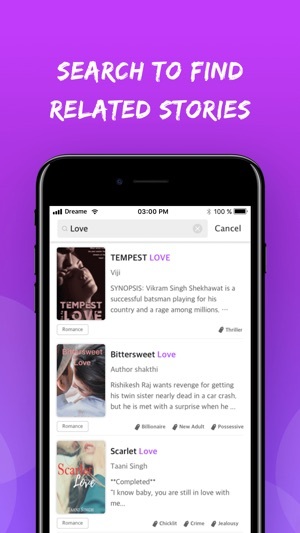 So overall best reading app I have as I really enjoy the aspect of reading other people's stories. I don’t like the fact that i would constantly have to pay money to read when i can just deal with very few adds that writers allow on their stories after a chapter and it be completely free. There are real published books out there so why should i have to pay to read these books that are not published and use wrong grammar and harder to read at times? I have friends who love to read online and can’t with this app bc you have to pay to read and they have bills to pay and still in high school and college. there should be daily coins or something that would make me and others want to keep the app. It’s pointless to pay to read amateurs books with many grammar miss usage and MANY MORE errors after every chapter when i could by a real published book online for cheaper. plus i prefer the turning pages style of reading and not then scrolling down and i couldn’t find a way to change that. Hi there, sorry about the grammar problem, the editor team will review the stories and suggest the authors to make improvement. As for the turning page style, the team will take it into consideration. Also, it adopts the coin policy for supporting authors' creative writing.